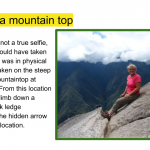 As an introduction to a course and to each other, students can share a selfie story of a different kind. They can be given options to sharing – what to share, where to share, and how to share. These can be decided based on factors the instructor and/or course designer may know about the students, the program goals, and the specific outcomes of the course. 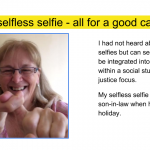 Students can be asked to share their ‘selfie’ as a one page story, or as a series of self selected images to tell a story about themselves. As an alternative option, rather than using images of themselves, they can share images of favourite toys, books, places, objects that are meaningful and even a shoe image. The writing to accompany the selfie image is written as if that image/object has a voice e.g. “Hi, I’m Helen’s favourite shoe because I’ve travelled with her to foreign lands, climbed mountains with her and kept her feet dry in the Amazon jungles.” Using a ‘first person’ perspective can reduce the barriers for sharing while still providing relevant and interesting insights into the individual student and their interests. This can help building connections and social presence in a course. If the instructor provides a model of their own selfie story, this helps build instructor presence, while engaging students and showing that they are also willing to risk sharing their ‘selfie story’. Here’s an example of a selfie story I’ve used as a model/mentor text to guide students into their own selfie story productions. 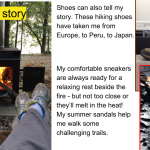 A google slides template can be provided but students can explore and share their stories in a template/format of their choice, depending on their comfort with sharing openly. These stories can be posted into the learning management system OR onto student blogs that are created and collected using an RSS feed, similar to the Ontario Extend collections. 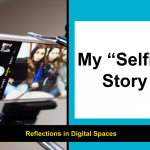 Here’s one example of how I’ve used this activity in an online course – Week One: My ‘Self’ in Digital Space. The course is a nine week, online course for Critical Digital Literacy for teacher candidates in their professional year.